What a mad day of gardening. Trying to get almost a couple of weeks worth of pleasurable planting done in one day. I’m on the plane to Corner Brook Nfld, anxious to see the twin grandchildren but apprehensive about the garden left behind in the middle of the busiest time of a gardener’s year. 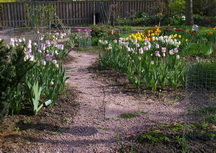 I decided that the risk of serious frost was minimal and so all of the annual flowers were planted. 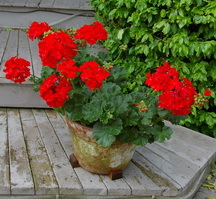 The whole winter’s worth of propagating, yielded the wonderful crop of bright red Geraniums that we put in the containers on the front steps, (picture right,) and in the long curved bed in front of them. The white Osteospermum were sprinkled between, hopefully to give a great red and white display all summer long. The Morning Glories were planted where their string trellises will be placed upon my return. The Pole Beans that will mix through them will start directly in that soil. Throughout the Wonderful Wander a range of other annuals, Flax, Cosmos, Dianthus, Asclepias were planted in interesting swirls to break up the vegetables that tend to dominate that section of the garden. The Peppers and Tomatoes remain in the cold frame awaiting my return and the guarantee of warm soil and weather. 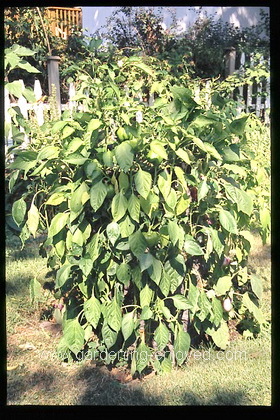 Some of those were moved up to larger pots so that they could increase in size and vigour and thereby provide me with earlier fruit. I believe I have mentioned before, my inclination toward competitive gardening. The last task before departure, early this morning was a slow wander around all of the garden. My stand in gardener, my long suffering wife, happily enjoyed the tour with me and assiduously took notes of the things that she needed to do in my absence. The abundance of Asparagus and the just budding Rapini will serve as a tasty reward for the time she spends helping my rapidly planted treasures thrive. The Spinach will provide a salad or two as well. The first of the Peonies, the fern leafed Little Red Gem, (picture right,) has just opened, about five days earlier than last year and I’m sure Pink Angel will follow soon. 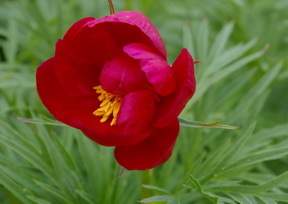 Be careful of the link on my Peony page, my favoured Peony nursery has just posted this year’s catalogue and it is addictive. The succession of Iris, in ever larger sizes, are putting on an amazing display this year and the buds forming in the tall bearded types, that are the season’s climax, promise a wonderful show by early June. I have some Nematodes arriving in my absence that are supposed to be a great control for the dreaded Iris borer. I fear they will be too late to be effective but we will apply, watch and report on the web site. The phone call upon their arrival, as the stand-in gardener reads the directions to me and asks just what she should do with these ten million tiny worms, should be interesting. The final task before quitting last night was to go to the basement and sow another whole range of seeds under the lights. The warm weather, fast growing vines: Cucumbers, melons, summer squash all found their way into large cells as well as some Zinnias and Nasturtiums and similar fast growing flowers. They only need about 2-3 weeks to get big enough to move to the garden. I’m now about to experience spring all over again, as Corner Brook is close to a month behind my part of the world. Two springs and two grandchildren; does it get any better. Donna asks? OK Ken, I have a small dilemma as to what to do with my little “spitter” pond. The motor that generates the ‘spit’ from the cherubs’ vase bit the dust. I loved the soft sound of water while sitting on my porch. Now, I would like to fill up the small container that is dug in the ground with some water plants this year. Are there a few plants that you can recommend to put in this container? Also, do I have to keep changing the water, or adding fresh water , or can these plants just sit in the same water all summer? The container is about 24 inches deep and about that size across in diameter too. Ken answers! You should be able to replace the little pump quite inexpensively and get your water sound back. The sound of the water is often the best feature of a pond. You can keep some plants in that little pond all summer and they will do reasonably well. Small water lilies, Pickerel Weed or some Papyrus will work. Refreshing the water by changing about 1/3 of it every 2 -3 weeks would help but you may be forced to do that by the evaporation. The bigger problem is mosquitoes. Without fish or moving water you have just created a perfect breeding spot for them right beside your deck. Selma Asks? I enjoyed your presentation on vertical gardening at Canada Blooms. I remember you talking about making a cylindrical planter for growing peppers with hardware cloth, filled with earth, and with a colander at the top for watering. Is the cylinder placed on the ground? in a pot? I think the peppers are planted in the sides of the cylinder.